Rhythm is the foundation of any song. It is also the first component of music that a person learns. As there are many types of drums and percussion instruments , we have prepared this shopping advice on the subject of Choosing drums and percussion instruments. 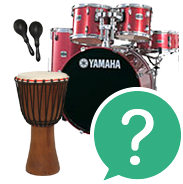 We can also help you choose drums and percussion instruments for children. There are many types of drums and percussion instruments on the market. If you are a beginner and want to learn to play the drums, we recommend choosing a complete set with hardware and cymbals . This type of set will have everything you need – simply assemble it and start playing. If you want to practice at home without annoying your neighbours, get yourself a set of electronic drums. These allow you to play into your headphones, and unlike acoustic kits, they produce only minimal noise. If you'd prefer a percussion instrument of a more intimate character, try a Cajon. This popular percussion instrument can imitate the sound of a bass drum and snare, is relatively small and beginners can learn to play it quickly. 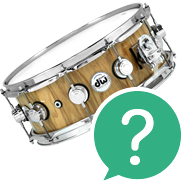 If you'd like to consult with an expert on choosing the right drums, don't hesitate to contact us. We'll be happy to help you. You can call us at 020 8089 1481 (Mon-Fri, 9 a.m. - 5 p.m.) or send us your questions by email to . Bass drum is a large drum set on the floor that is played with a foot pedal. As its name suggests, the bass drum has the deepest sound. Snare drum is used to create rhythm. The snare drum and the bass drum are the most important parts of the drum kit. The snare drum is usually placed between the drummers legs. Tom-toms are placed above the bass drum. They are often used in pairs and serve mainly for playing transitions and breaks. In drum lingo these are often simply referred to as 'fills'. Floor tom is also used to play fills. Floor toms are set on the floor, and the vast majority of drummers have them on their right side. Cymbals are another inherent part of drum kits. While there are many different types of cymbals, the basic set is mainly composed of these types: Hi-hat, Ride and Crash, which are then supplemented as needed by effects cymbals (e.g. ChinaandSplash). All of these cymbals exist in a range of sizes and materials. There is no such thing as an ideal number of individual drums and cymbals in a kit, as each drummer has different needs. Still, we regard the foundation of a drum kit as a snare and a bass drum and a hi-hat cymbal. We recommend that drummers buy a complete set with hardware (stands, bass drum pedal, etc.) and cymbals. We also have drum kits drum kits for the youngest drummers, which are sized for smaller players to make them easier to play. Electronic drums are similar to classic drum kits – their foundation is also composed of a bass drum, snare, toms, cymbals and others. However, in this case the actual drums are replaced bypads, mostly made of plastic and containing built-in sensors. The sensor records the strikes with drumsticks and the signal is transmitted to the sound module that is always part of an electronic drum kit. The sound module then creates a digital sound from the transmitted signal. Electronic drums can be connected to any amp, speakers or Hi-Fi device. The enormous advantage of these drums is that you can connect headphones to them, allowing you to enjoy the sound of the drums without disturbing people around you. But electronic drums have more advantages. Their sound module can be set in various ways so you can choose the precise sound you want for the entire kit. You can typically choose between a rock sound, an electronic music sound and others. 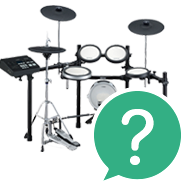 Electronic drums are also ideal for beginners because they contain various sound programs. Another enormous advantage is the fact that you can connect an external music player to them (mp3, telephone, etc.) and play along with your favourite tracks – all with your headphones on. The family of percussion instruments includes all acoustic percussion instruments that don't belong to classic drum kits. These include the entire line of ethno-drums, rattles, scrapers and melodic percussion instruments such as djembe, bongos and congas or the popular cajonortambourines, castanets, triangles, vibraphones or xylophones. Boomwhackers are a huge percussion hit. Although this percussive-melodic instrument is ideal for children, adults will have a blast with it, too. Boomwhackers are an excellent way to learn rhythm and melody and also develop a sense of teamwork. There are many percussion instruments for children as well as various children's drums. Drummers will also need certain types of accessories for their kits. This mainly concerns drumsticks, stands, thrones, tuners, tuning keys and others. And don't forget to have replacement skins on hand.